Glasgow and the west of Scotland was battered by stormy weather on Thursday that blocked roads and shut schools. 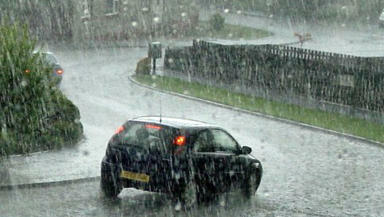 A school bus was blown over and a large number of roads were blocked as severe storm weather hit the west of Scotland. Roofs of buildings and trees were blown over on several roads in Glasgow and the surrounding area on Thursday. In Byres Road in Glasgow’s west end, part of the roof of the building where Superdrug is located was torn off in the wind, forcing police to close the road on Thursday afternoon. The road was closed from the junction of Great George Street to the junction of Great Western Road due to the building being deemed dangerous. On the A737 near Dalry, North Ayrshire. a school bus was blown over in the high winds at around 10am. The road was blocked for several hours as police tried to clear it. The bus was empty of passengers at the time and the driver did not sustain any injuries. In the evening, rail services had to be suspended between Glasgow central and East Kilbride after a tree fell on the line at Giffnock. Masonry from the roof of the Spice of Life restaurant in Bellshill, North Lanarkshire, was blown onto the road below during the severe weather, while similar instances of roof panels and material blocking roads were reported in Glasgow, Helensburgh and Gourock. The Erskine Bridge was closed on Thursday morning after winds of 80mph battered it, while the Clackmannanshire Bridge was closed to high sided vehicles. In Kilmarnock, diversions were put in place around St Marnock's church after the steeple was declared unsafe. First Bus withdrew all double-decker buses from service in Glasgow on Thursday afternoon as the weather worsened, although the Glasgow subway was allowing all bus passengers with a First or Arriva ticket to travel for free on the underground. Flooding on the M8 at Langbank caused delays, while Glasgow Airport said it would be expecting delays and cancellations to flights. Renfield Street was closed between Renfrew Street and Bath Street because the roof of the Cineworld building was deemed "unsafe". Strathclyde Police advised against travelling on roads on Thursday afternoon after the Met Office issued a red warning for severe weather. Every council-run school in Glasgow, South Ayrshire, East Ayrshire, North Lanarkshire, South Lanarkshire, Dumfries and Galloway, East Renfrewshire, West Dunbartonshire, East Dunbartonshire and Inverclyde will shut for the day, while schools in the Renfrewshire Council area will close at 1pm and in Stirling at 12.30pm. In Clackmannanshire, schools will close at noon, however Clackmannan Primary closed earlier after the gales caused damage to the roof of the building. Meanwhile, the Pavilion Theatre in Glasgow was forced the cancel the morning performance of the pantomime Peter Pan - starring comedian Jim Davidson - for health and safety reasons following the adverse weather. The evening show will go ahead. For more information on being ready for winter, visit the STV Health Centre, brought to you by NHS inform.